Continuing my series of posts on signed first editions, this week I've got two books by the same author – a British thriller writer who's made multiple appearances on Existential Ennui over the years: Gavin Lyall. 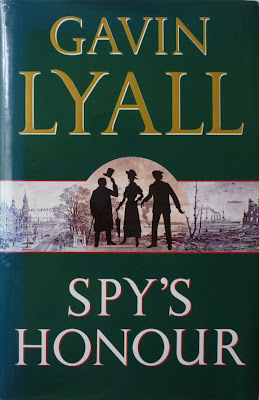 And my research for one of those books has turned up an interesting nugget of info about another of Lyall's novels, so there'll also be a bonus post on him. Plus there'll be some Donald E. Westlake business as well, as I return to the short stories Westlake wrote for various science fiction magazines in the early 1960s (which I'll be cross-posting on The Violent World of Parker, of course). The unusual thing about both of the signed Gavin Lyall books I'm showcasing this week is that, so far as I've been able to establish, Lyall didn't appear to sign that many books. 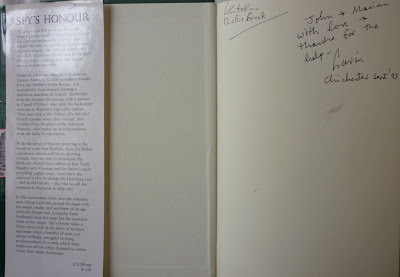 AbeBooks, for example, currently lists a grand total of just three signed Lyall books, which, considering he wrote fifteen novels and two non-fiction works over nearly forty years, and that many of those were bestsellers, is a remarkably small number. 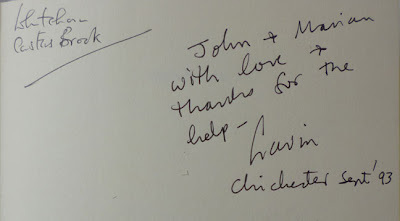 Those he did sign tend to be association copies, that is, books inscribed for friends; both of the signed Lyall novels I own bear self-evidently personal inscriptions – Lyall uses just his first name in each case – and I'd be willing to bet those scant few lurking on AbeBooks are association copies too. 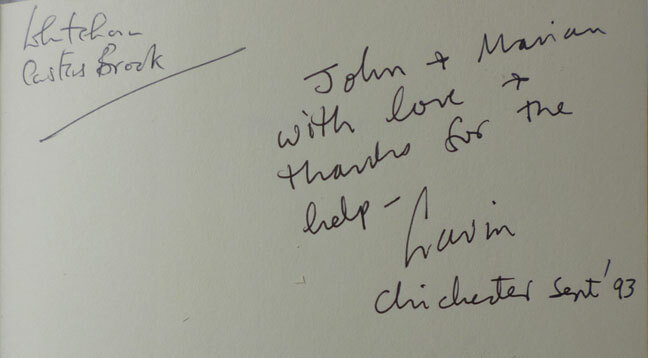 Which makes me wonder whether, gifts for friends aside, he simply didn't sign his books. Spy's Honour was published by Hodder & Stoughton in the UK in hardback in 1993, with a front cover illustration by Bill Gregory. 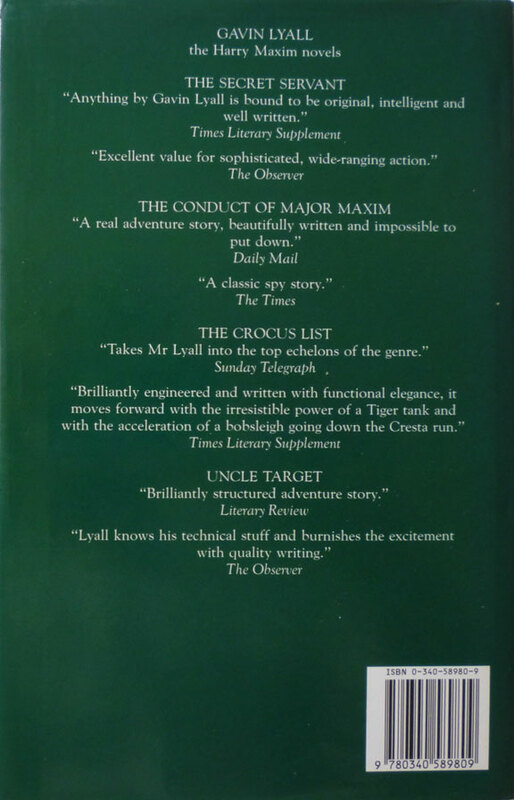 Now, it's worth noting here that Gavin Lyall's writing career can be divided up into three quite distinct phases. The first phase, from 1961's The Wrong Side of the Sky to 1975's Judas Country, consists of first-person aviation and Euro thrillers, largely – but not exclusively – starring hard-bitten freelance pilots; you can read my review of one of them, The Most Dangerous Game, here. The second phase, from 1980's The Secret Servant to 1988's Uncle Target, comprises a four-book espionage series starring 10 Downing Street troubleshooter Harry Maxim; you can read my review of the first novel in that series here. 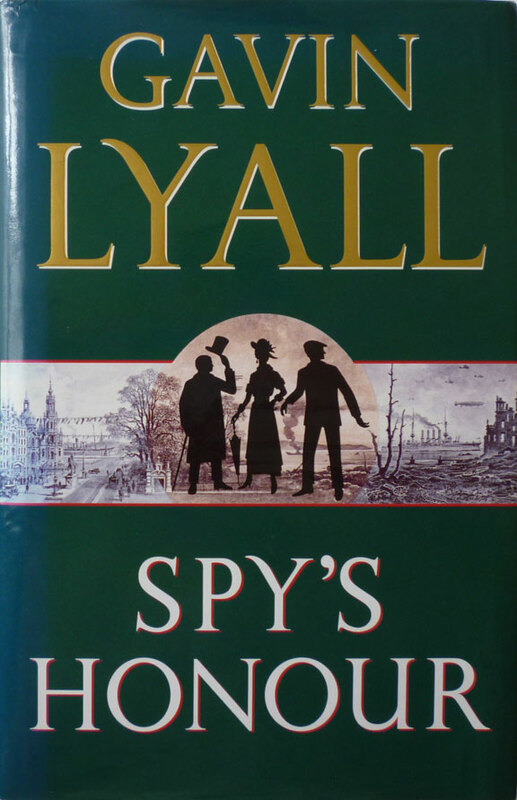 Spy's Honour marks the beginning of the third phase of Lyall's career, and of the three, this is the one era I've yet to explore properly. The four books Lyall had published from Spy's Honour to 1999's Honourable Intentions are all set in the run-up to the First World War, and deal with Britain's nascent intelligence service. If they were published today I suspect they'd do rather well, what with the ongoing vogue for historical fiction and interest in that period in particular in the wake of Keith Jeffrey's 2010 tome MI6: The History of the Secret Intelligence Service; but at the time I don't believe they were as successful as Lyall's earlier works, and consequently all four have fallen out of print and become quite scarce in non-ex-library first. I read The Wrong Side of the Sky a few weeks ago and liked it; would you have any recommendations for other Lyall books to read? I'm thinking I might try one of the non-aviation books next. I'm curious to see what you think of Spy's Honour. Well if you're looking for a first-person non-aviator book, the one I'll be blogging about next is a solid read (more on that soon). But you might want to try The Most Dangerous Game: it's an aviator one, but it's even better than Wrong Side. And the Harry Maxim books are great too, starting with The Secret Servant. Thanks for the advice. I found a very cheap copy of The Most Dangerous Game at the corner bookshop, so I'll probably try that next. You're in for a treat: it's a cracker. I have been a fan of GL since the late 1960's and count his first 6 books amomng my favourite crime /thriller Books .I am particularly proud of my 'association' signed copy of Judas Country; inscribed under the tille " ...or Civil Aviation in New Zealand an Illustrated history; (I hope you like the original title ) Love Gavin."